Did you know that Kettle Range offers grass fed gift boxes? It’s an excellent gift idea for your favorite foodie or local grass fed beef and pork fanatic, and we’ll ship it right to their door. Whether you are shopping for a barbecue master or a local food fan, we have a perfect gift box. Each grass fed gift collection includes a hand-picked selection of our premium, locally raised and locally processed grass fed beef or pork. Fabulous Foodie Collection: Grass Fed Flank Steak, Skirt Steak, Flat Irons, and our popular Tri-Tip Roast. 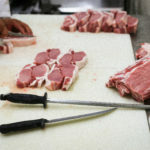 Steaks, Chops & Bacon: Grass Fed Ribeyes, thick cut Porterhouse Pork Chops, and our delicious uncured, house smoked bacon. Classic Steak Lovers Collection: All of the grass fed classics: Filet Mignons, Ribeyes, New York Strips and thick, juicy Top Sirloin steaks. Our grass fed steaks and other goodies are flash frozen for freshness and lovingly packed in an attractive insulated shipping cooler. They can be shipped anywhere in the lower 48 states. Online prices already include the costs of handling and dry ice. Shipping charges apply. Holiday orders must be received by December 18th in order to arrive by December 24th. Shipping boxes of grass fed beef around the country is complicated and expensive. If you live in Milwaukee and want to save some money, you can pick up your gift box at our Milwaukee butcher shop (5501 West State Street). We’ll give you a 10% discount and you won’t be charge shipping. A delicious Heritage Holiday Ham is a classic way to celebrate the holidays. Kettle Range is preparing a limited number of 8-10lb Holiday Bone-In Half Hams made from delicious heritage Duroc pork. Each Heritage Holiday Ham is traditionally cured using a time-honored recipe and then hickory smoked with just the right amount of sweet and savory maple flavor. This beautiful Heritage Ham will make a beautiful centerpiece for your holiday feast. Each half-ham is fully-cooked and and ready to serve 10-15 hungry guests. No cooking is required. All you need to do is warm it up. Our heritage Duroc hogs are raised using traditional methods and are never given sub-therapeutic antibiotics. Kettle Range hams are Ractopamine free, just like all of heritage pork. 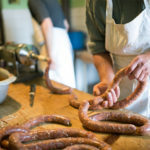 Kettle Range Meat Co. is Milwaukee’s premier farm-to-table butcher shop. Holiday hams can be picked up at our Milwaukee butcher shop (5501 West State Street) any time during the week of December 19th. They can be shipped fresh anywhere in the continental United States (additional charges apply) up to our December 18th shipping cut off date. Each holiday season, we cure and smoke a limited number of heritage half hams and we expect to run out well before the holidays. If you would like to get ahold of one of these delicious and unique, locally produced hams, place your order soon! Click here to RESERVE YOUR HOLIDAY HAM.